Just like all of her classmates at El Cajon’s Christian High School, Brittany Wnek grew up going to school, participating in a variety of school activities and sports — just being an everyday kid. Then one day she found her life consumed with hospital appointments, CT scans and MRI’s, chemo, radiation and many surgeries. Along with regular treatment at Rady Children’s Hospital and the UCSD Moores Cancer Center, the family has traveled to Texas and New York seeking solutions for her rare disease called Mastocytosis, a disease characterized by the presence of too many mast cells in various organs and tissues. In Brittany’s case, the Mast cells collect and form tumors, which have become destructive to bones in her skull, spine and pelvis. Originally, Brittany was diagnosed when she was just 12, after she underwent a CT scan that revealed a tumor behind her left ear. Brittany recently spent more than two months in the hospital undergoing major surgeries and some setbacks, but was finally able to go home in time to celebrate her 17th birthday. It has been a challenging journey but the family continues to seek answers, and pursue treatment. “We have so many people praying for Brittany as she goes through these ongoing battles. We believe in the power of prayer, and are thankful,” added her mother. 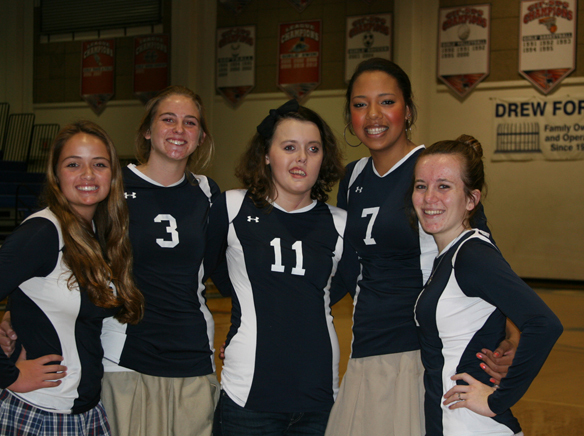 With Brittany unable to start school this past fall, her athletic career was put on hold at Christian High School. Gaby Grabowski, one of her teammates, approached her parents because she wanted to do something special for Britt, and the Grabowski family. As a result, her parents John and Gabriela Grabowski, owners of Aztecas Design Inc. located at 435 W. Bradley Ave., in El Cajon, will be hosting a benefit Holiday Craft Fair at their business from noon to 4 p.m., on Saturday Dec. 8. Aztecas Design Inc. imports Mexican hand-blown glassware products nationally for the restaurant industry. They will be offering exclusive, custom-crafted glassware, including pitchers drinking glasses, margarita glasses, Christmas ornaments and more decorative items, for a minimum donation. At the fair, 100 percent of the purchase price on all Aztecs Design Inc. sales will go to benefit Brittany Wnek. The fair will also feature a variety of craft vendors and food items, plus a live band. Brittany’s volleyball coach, Debbie Larsen, and her volleyball teammates are also gathering to assist with the Holiday Craft Fair, which will benefit Brittany with the on-going costs associated with her treatments. According to Gabriela Grabowski, “Everyone loves Brittany so much, so we gladly want to step forward and help her. We believe there are many businesses in our community who can make an impact in the lives of families in our community. We want to encourage everyone to come out for this special event,” added Grabowski. For information, contact Gabriela Grabowski of Aztecas Design Inc. at (619) 985-6940.